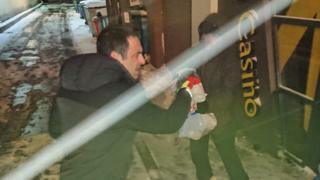 Snooker star Ronnie O'Sullivan bought food and drink for a homeless man lying in the snow in Cardiff. The five-time world champion had left the Motorpoint Arena after losing in the quarter-final of the Welsh Open when he came across the man on Friday. Student and snooker fan Matthew Lofthouse spotted O'Sullivan speaking to the man. The player then went into a nearby store, bought sandwiches and drinks and handed them over. Mr Lofthouse, 23, who captured the gesture on his phone, said: "Just by chance I saw Ronnie there speaking to him. "He saw this homeless man lying on the floor and went into a Tesco and bought him a couple of sandwiches and drinks. "Ronnie insisted on the homeless guy not saying thanks to him," said Mr Lofthouse, who is originally from Manchester and studying at the University of South Wales in Cardiff. "He said, 'mate, don't worry about it'." The temperature was about -2C at the time, on the day after a snowstorm blew across much of south Wales. Mr Lofthouse hopes the man was then offered shelter for the night, as he saw a woman come and help him after O'Sullivan left.